Who and what do you really believe in? What do you want in life financially, spiritually, professionally? Are you making a difference in society? Are you an effective leader and knowledge worker? Leaders and knowledge workers are people whose primary work activities include creating, using, and distributing information. And finally, what is your primary TALO Leadership Profile? Dr. King was a 3 & 4. President Barack Obama is a 5 & 6. Dr. Maya Angelou was a 4 & 5. 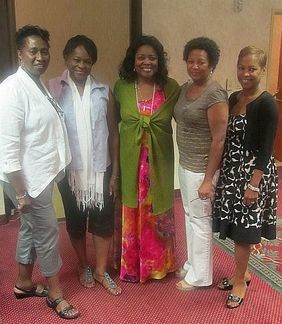 Pictured left are five participants of the 9th annual HHEW Leaders Conference & Retreat (2012), Dr. Carolyn B. Buck, CEO, Alternative Organizations LLC (Bakersfield, California), Dr. Gloria Willingham Toure', CEO of The Village P.r.o.j.e.c.t.s (Santa Barbara, California), Dr. Elnora Tena Webb, President of Laney College (Oakland, California), Carla Willis, then Assistant Vice President for Development at The Ohio State University Medical Center, and Jacqueline E. Brown, Las Vegas, Nevada educator and President of the Las Vegas Chapter of Alpha Kappa Alpha Sorority, Inc.
Aubry Stone, President of the California Black Chamber of Commerce, Nevada State Senator Steven A. Horsford, Nevada State Senator and Las Vegas attorney Aaron Ford, Las Vegas Urban Chamber of Commerce President and MGM Mirage Vice President of Corporate Diversity and Community Affairs Debra Nelson, and Las Vegas ophthalmologist and humanitarian Dr. Kenneth Westfield have been among the local and national panelists at this annual international gathering. Whether you know it or not, most of the world's most important decisions and policies are made by think tanks. Congratulations on being invited to join the HHEW 100 Group Think Tank, an exclusive group open to only 100 people worldwide. Please take a few minutes to peruse our official website, our scholarly ejournal and our parent organization. We believe you will be impressed, inspired and a be positive fit with our current members. That's it. The deadline to accept this invitation, with membership payment, is June 30, 2014 by 5 p.m.
Do you like working with and knowing open-minded people who are committed to improving the lives of people of African descent (and all people for that matter)? Most people cannot name one or two think tanks, but that is not surprising because most think tanks work behind the scenes. We go one step further; we work behind the scenes for the betterment of society and the world. Although the majority of our members are college graduates, you do not need a college degree to join us. We only ask that you be open to getting to know and work with a team of positive men and women. 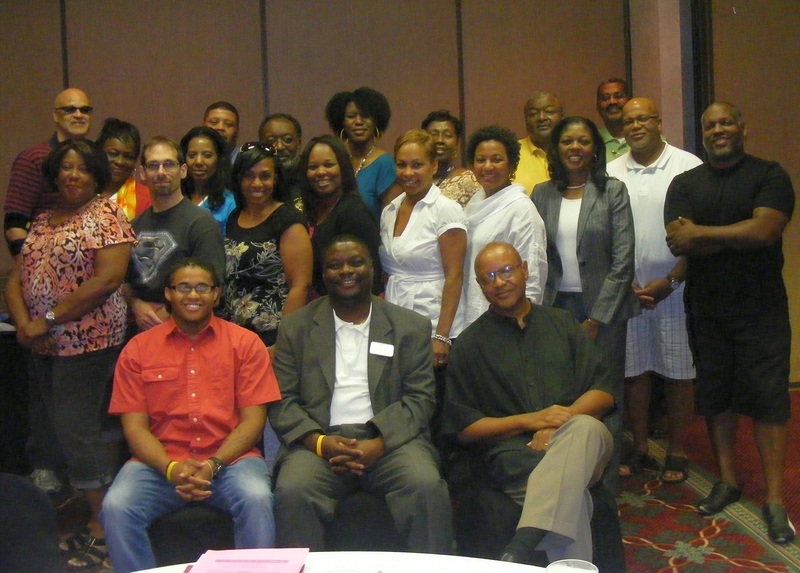 Within the group are people with Ph.D.s and J.D.s, some with no degrees, some doctoral students/candidates, peope with MBAs, attorneys, newspaper publishers, a film maker, a slam poet, educators, ministers, college professors and administrators, and several parents, activists and professionals interested in discussing, understanding and elevating the Black world experience via the TALO Leadership Theory. And yes, we have online rules and guidelines and a schoarly ejournal, if you have an interest in publishing and research. We primarily focus on African-American and African-world issues via email. Some of our discussions are very serious, while others are light and humorous. I hope that you will accept this invitation. You are being invited in by moi/me (the founder). Other members are also currently extending invitations to prospective members at this time from around the world. Let me say up front that this group is not very time-consuming or “stuffy”. Instead it is “like a group of friends sitting around the table...” Our primary modes of communication are via an outstanding social media forum, emails, our ejournal, and our annual conference & retreat. Your first year's (2014-2015) membership fee is only $85 (due by July 1; $75 if paid before Sunday, June 15). Your lower second year's dues ($75) will be due next summer 2015. We also look forward to seeing you in Las Vegas next year at our 12th annual leaders conference & retreat. By December 31 of each year, each member also contributes $100 to the upcoming annual conference & retreat, whether the person attends or not. Should you decide to attend, you can pay (add) the balance of your registration fee to the $100 by March 31 of the conference year. (For those of you in education or with a fiscal year ending in June, this is a great, inexpensive year end conference. For those of you looking for a quick, inexpensive, professional, fun get-away, this is it!). Please click here for payment instructions (via PayPal or by check). If for some reason you are not able to attend next summer (or this year), no problem. This invitation to join stands thru this June 2014, but we will need to hear back from you ASAP if this is a body that you would like to join. By the way, belonging to a think tank is impressive to list on your resume or at other professional or family gatherings. At some point, I will need your photo for our website, email address and very brief bio (photo and bio will be posted at the HHEW 100 Group website). By the way, as one extra bonus, you will automatically be added to our speakers directory (if you would like to be added). This is a great way to possibility earn extra money, while providing a professional service. Please reply to this invitation/email at: kohhhew@invrhhew.org or via my Facebook invitation. Thanks. I look forward to hearing from you ASAP. How much is your very inexpensive membership into the HHEW Group possibly worth? "The key to the key to success"